Next week the Dia-Stron Sales team will be in sunny Dallas, Texas for the biggest CAMX event to date, taking place at the Kay Bailey Hutchinson Convention Center between the 16th and 18th October. 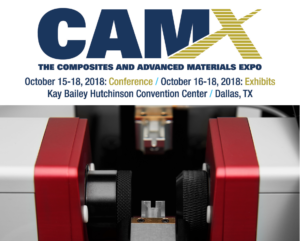 The Composites and Advanced Materials Expo (CAMX – https://www.thecamx.org/) is the co-creation of the American Composites Manufacturing Association (ACMA) and the Society for the Advancement of Material and Process Engineering (SAMPE), leaders in the field of composites and advanced materials technology. The event brings together exhibitors and visitors from R&D, engineering and manufacturing to service providers and consumers, across a huge range of industries such as transportation, aerospace, energy, construction and academics. It’s an opportunity to network, but also learn about the latest innovations, factors impacting the industry and cutting-edge research taking place around the world. Joe and Henry will be representing Dia-Stron on booth W47, on hand to discuss our range of technical fibre analysis systems for carbon, ceramic, basalt, natural fibres and more. Please drop by to discuss your fibre testing requirements!